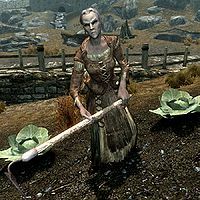 Nimriel is a Bosmer farmer who works and lives at Pelagia Farm, which is owned by Severio Pelagia. She takes over Pelagia Farm when Severio dies during the Battle for Whiterun. She does not offer any conversation options other than generic greetings. She sleeps from midnight to 8am, then wakes up to tend the farm's crops. She works until 8pm, when she heads inside the farmhouse and spends the rest of her day eating and relaxing. She wears a set of farm clothes and a pair of boots. She is equipped with an iron dagger and carries a key to the farmhouse, as well as common items and gold. When talking to him, Severio may mention Nimriel: "I own the Pelagia Farm, just outside the city walls. Nimriel takes good care of things for me." This page was last modified on 15 February 2014, at 07:30.